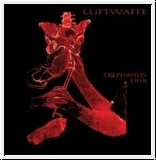 Re-Release of the Luftwaffe classic with reworked artwork. Disturbed discourse unveils ‘Trephanus Uhr’ behind an unsettling child’s voice looped in a continuous stream, fabricated distortion filtering all frequencies in some form. Proclamations drive the vocal element more than attempts at harmony, and given the lice-ridden decay of percussion and throes of grated mechanisms lends the work a sinister affair, even when said utterances are drenched in filtered corruption. The rhythms at times are stilted, but subsequent tracks demonstrate more hypnotic martial rhythms that Luftwaffe seems best at on this album. Vanes of looped vocals adorn the reaches of most tracks, streaming ticker tape of debased echoes, adding to the dominant theme of the voice as sounding board. A pall, a mist of ashes obscures nearly all tracks on ‘Trephanus Uhr’, warping all sound in viscera of volcanic aftermath and destruction, drums grained and vocals rotted to gargling bellows. Folk tracks oddly pepper the furor with martial murk, a few of these tracks are not digested through the rasped tract, and for a large run of successive tracks the industrialism fades before a blend of folk and martial destruction meets and leads out the album." Diesen Artikel haben wir am Dienstag, 01. Januar 2013 in unseren Katalog aufgenommen.